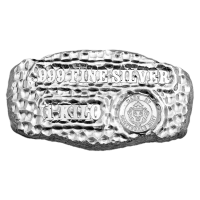 The 1 Kg Scottsdale Mint Tombstone Nugget silver bar has a rugged, individual look, reflecting the Old West heritage of this bar. These bars are minted just North of Tombstone, Arizona, the infamous 19th century frontier town which was the scene of the Gunfight at the OK Corral. Each bar has a slightly different shape and personality, and the bar is dimpled and rippled to appear like a raw nugget. These bars are packed in a draw-string fabric bag and come with a certificate of authenticity.